MFG is a dynamic team of experienced work force that always achieves their Client’s goals in successful project delivery. MFG have a staff of more than 130 at present and within that team there are key management personnel as described below. Ron began his pipeline construction career as a 17 year old pipelayer in the beautiful Victoria township of Bright when it was being sewered in the early 1980’s . Whilst only in his early 20’s he was offered a partnership in another pipelaying business which lasted some 15 years. Ron then established MFG in 2004 as sole owner/operator. Since its first year of operation MFG has grown tenfold in turnover with a loyal and dedicated staff, exceeding 180 at October 2013. Through his broad project construction background Ron brings a wealth of experience to deal with any complex situation in a practical and efficient manner, as well as an excellent working relationship with the Client’s Project Managers – such relationship being the result of reliable and efficient contract services by MFG on past projects. He leads by example and is the ideal mentor for future foremen and supervisors in his ever growing team. Ron is a keen surfer and lives near the beach. He also enjoys a small punt on the races and religiously follows his beloved Carlton AFL team. Steve has worked in foreman and supervisor roles in the civil construction industry for the past 30 years and with Ron since 1996. He is also a multiple skilled machinery operator with Cert III and Cert IV qualifications. Steve is the construction manager for all of MFG’s major projects such as Pacifico, APLNG or any isolated project works. Apart from project control he also works closely with Ron in determining project resourcing and daily work crew operation requirements. Steve is a mad ARL follower and fanatical Broncos supporter. Sam has 15 years experience in the civil works construction industry with primary experience in drainage, sewers, water main and utility services. Following several years of foreman experience Sam has spent the last 7 years as a major project’s Supervisor for MFG at a variety of locations. Sam has his Cert’s III and IV in pipeline construction as well as operator tickets and accreditations for excavator, back hoe, loader, roller, bob cat, dogman, confined space, working at heights and first aid. When Sam is at home, he puts his expert fisherman skills to use and never misses a good catch; and catching up with his family. Troy has worked with MFG since 2006, starting off as a labourer, then being promoted to Pipelayer, Leading Hand, Foreman, Assistant Supervisor and now Supervisor. Troy has excavator operator, dogman, first aid and working in confined space tickets, as well as a Cert III in pipelaying. He has a young family and enjoys time off with them to watch movies. He also actively pursues hobbies in fishing, snorkelling and barracking for his favourite footy club, the Paramatta Eels. Sean has worked with MFG since 2008, starting off as a labourer, then being promoted to Pipelayer, Leading Hand, Foreman and now Supervisor. He has many qualifications and a variety of active hobbies. Trevor has over 30 years experience in all fields of the civil contracting industry including supervisor and foreman roles. He brings a wealth of knowledge and computer skills to the critical roles of tender preparation and contract negotiation, with an up to date understanding of how to arrive at competitive project pricing through a good appreciation of the most efficient and effective construction methodology. He also manages all claims processing in close liaison with the relevant Project Supervisors and Foremen and closely monitors industry related market pricing so that MFG remain competitive at all levels. Trevor’s past time includes a DIY enthusiasm for any type of craftsmanship around his or his mate’s homes. Steve manages the day to day operation of the OHS Management System through regular site visits to all MFG projects. He has 10 years experience as a Workplace Health and Safety Officer. Duties include the preparation of SWMS and consultation with employees during site inspections, Audits and Incident Investigations. His qualifications include an Advanced Diploma in OHS, Cert IV in Workplace Training and Assessment, Qld Fire Safety Adviser, Workplace Harassment Contract Officer and Senior First Aid. Steve is a keen recreational fisherman and gets away on his fishing boat as often as possible for a relaxing weekend. Lynette has worked as Office Manager for 13 years having been with MFG since it commenced in 2004. She also worked for Ron McFadyen in his previous civil contractor partnership. Her duties include management of company cash flow, processing and payment of invoice claims and weekly wages, personal assistant duties to Ron McFadyen, staff travel and accommodation arrangements, and general book keeping. Lyn also performs the Company Secretary role for MFG in keeping records at Board meetings and in checking that all other company related administrative procedures are properly completed. For relaxation Lyn loves to watch the latest release movies with her family. Damian has worked at sales, customer service and operations within the Plant Hire Industry for civil contractors for over 15 years . Prior to this Damian spent 5 years as a foreman for laying pipes in tunnel construction. He brings an enthusiasm and thorough market understanding to the table which has allowed him a running start as manager of this important division within MFG. He also has a strong network of both customers and suppliers which, when combined with existing MFG relationships, will ensure that MFG’s Clients get the best Plant to suit their projects and therefore achieve desired outcomes. Damian has his own 30 footer which he uses regularly for recreational fishing trips. MFG have experienced and certified Fitters responsible for servicing, maintenance and repairs of all of MFG’s Plant and Equipment at all local and isolated projects such as Upstream APLNG, railway extensions (coal mines/other) and Pacific Highway upgrades. For isolated projects the Fitters work at least a weekly roster basis to ensure that at least one Fitter is always available at any time. The Fitters report directly to MFG’s Head of Servicing and Maintenance who carefully monitors all maintenance, servicing and repair work for prioritisation and action via MFG’s strict reporting procedures. At all times the Fitters must adhere to all aspects of MFG’s QA, safety and environment controls for all works performed. MFG have a policy of a minimum of 3 to 4 years training as a pipeline worker before any party can be considered as having potential as a Leading Hand or Foreman. Each of the current Leading Hand and Foreman team are experienced personnel who have achieved such training in a variety of pipeline projects in a variety of conditions, sometimes requiring relocation of themselves and family for long periods of time either interstate or intrastate. More recently nearly all have spent time working at MFG's APLNG projects, either at Curtis Island or Reedy Creek. Their experience in the pipeline construction industry ranges from 4 to 15 years. 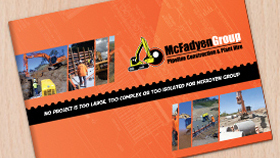 MFG’s Leading Hand and Foreman team all have various machinery operator tickets and workplace accreditations (such as Cert 3, excavator, loader, back hoe, rollers, bob cat, dogman, confined space, working at heights and first aid), with specific operations focus on safety, quality assurance and environmental issues.